Official Launch: The Next European Jewel is Statoil! Yes, my next stock pick for this European turmoil is Statoil ASA. 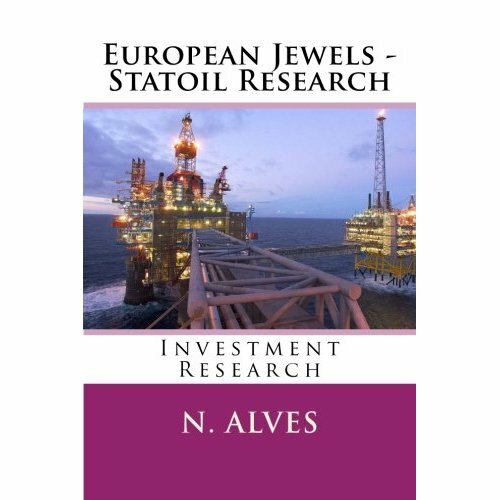 My second book of the European Jewels collection has just been released and it is about Statoil. In my book, a 10.000 words statement, I explain in a detailed and thorough manner why this is my second choice to join Santander Bank in my portfolio. I explain why the oil and gas market are great hedges for any portfolio, and why I chose an Norwegian company to do the job. Furthermore, I took a deep commitment with the pricing of this new book. This time I chose not to use any graphics or tables that could need colors, instead I made a great effort to state my ideas clearly without the need for elaborated charts. This way the costs of this book are significantly lower than the previous Santander Bank volume. The idea is simple: I want to offer to more readers the opportunity to assess my investment ideas. In relation to the previous edition, I had thought about decreasing the price, but I won’t do it. The reason for this is the fact that it is my soundest investment idea and I do not believe that I should be sacrificing a book that I believe will offer great returns to investors. I could at least create a new version without the graphics, in black and white, which could take the price down. However, I do believe that the graphics are needed and I should not sacrifice quality even if I could get better sales by doing it. Previous Post Apple: Is Eating the World a Possibility? Next Post Doing What is Right!